Sirena features four unique, open-seating restaurants, a world-class fitness center and spa, eight lounges and bars, a casino and 342 lavish suites and luxurious staterooms, nearly 70% of which feature private verandas. 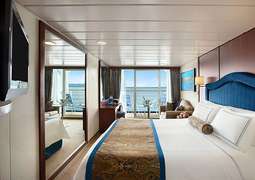 The generous dimensions of the suites and staterooms afford the ultimate in luxury. 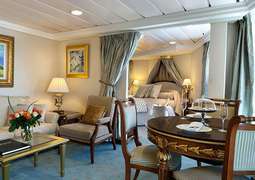 Interiors are decorated with traditional hardwoods, rich fabrics, fine furnishings and original art. 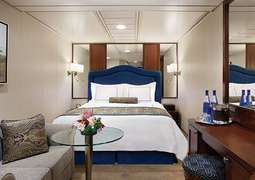 Plump the goose-down pillows of the Prestige Tranquility Bed, an Oceania Cruises exclusive, and relax in bed. 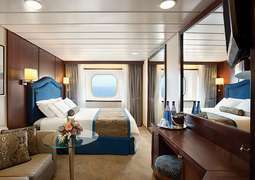 All suites are uncommonly spacious for added comfort. Penthouse Suites offer oversized living and dining areas, and marble and granite-clad bathrooms with a bathtub. The Grand Dining Room’s formally attired and classically trained wait staff graciously serve course after course of European-inspired cuisine or delectable alternatives such as healthy Canyon Ranch signature dishes. Menus change daily with a brilliant choice of at least ten appetizers, soups and salads and twelve entrées at dinner. The Polo Grill embodies all the elements of a classic steakhouse. In the Toscana restaurant classic dishes from various regions of Northern Italy are featured. Informal and carefree, the Terrace Café is wonderfully inviting any time of day. Located in a spacious, shaded area steps from the swimming pool, Waves Grill offers an extensive and mouthwatering luncheon menu. Also available: afternoon tea, coffee bar and room service. The stimulating variety of entertainment options on board Sirena continually ensures your interests are piqued. Enjoy an engaging guest lecture by a historian, naturalist or former ambassador eager to share insider knowledge. Relax at a musical performance, perhaps featuring a live pianist, a classical string quartet, a dynamic vocalist or a spectacular headliner. Later, try your luck at the elegant Monte Carlo-style casino or go dancing at Horizons. You can also the Canyon Ranch Spa and the state-of-the-art fitness centre.